I'd been wanting to go for something big this week, but when the suggestion of Sky Pond came up, a shorter day felt ok. Plus I had two attempts and two failures at this body of water over the winter, and wanted to get to it quite badly. On my most recent attempt in early April, I encountered quite slushy snow conditions on the way back, and I remembered thinking, "This will be good to go in a week or two. Unless it snows again." And then we went on to have one the snowiest Aprils on record. Alberta Falls now melted out and spectacular. We encountered this guy and later a female around East Glacier Knob. No calves were seen, but just keep your eyes open. He did not want to give up the trail, but I found my deer removal technique (which is to skitter a rock along the ground in front of them) worked well here, despite my bad aim. Looking up to Loch Vale- similar view here in winter. At The Loch. The predominate rock face in the middle separates the way to Sky Pond (left) and the way to Andrews Glacier (right). 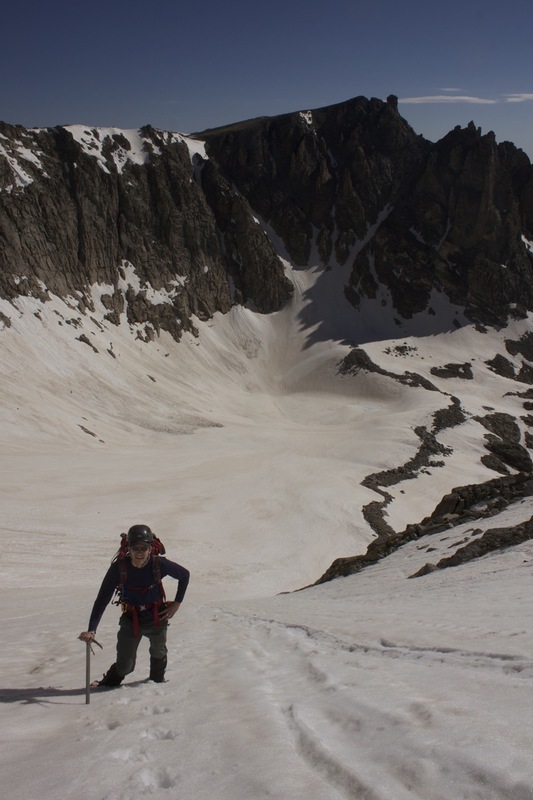 Here is Dan ascending the standard route, which had previously been buried in snow and had corniced snow atop it. There is still some lingering snow and ice, and the waterfall has wet some of the rock as well, making things a bit slippery. Use caution! Powell Peak as seen from Sky Pond. It was nice to finally be here after several attempts! And I sighted the first Marmot of the year, and witnessed it apparently eating lichen off of some of the rocks in the area. Either that, or they eat rocks. Dan remarked that Powell Peak is the only peak on this region of the divide which he has not done yet. Which means we will probably be on top of it soon. From looking at the zero feet of snow right next to it, this snowfield appeared to be about 12 feet deep. Glass Lake was quite pretty as well. Back down to The Loch and beyond. Dan had a big day on Sunday, ascending McHenrys Peak, one of the hardest in the park. I had earlier suggested adding on Glacier Knobs since we go right by them and had talked about doing them at some point. It was only now that he said yes. 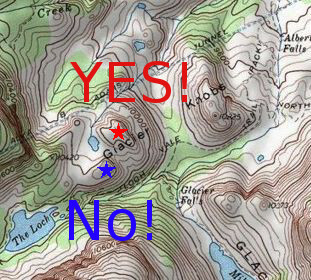 I have described how to find West Glacier Knob here. It can be a bit tricky, as there are two high points in this area, and the western one of those looks like it is higher. But West Glacier Knob is actually the eastern high point here. Hopefully that explains it a little better. A little guy came out to look at us longingly as we snacked. Back up to Loch Vale. And into Glacier Gorge, Half Mountain and Storm Peak visible on the ridge line extending from Longs. We got back down to the trail and continued down. Shortly after reaching the fire trail, we started our ascent of East Glacier Knob. We ran into this cow Elk pretty close to where we saw the male. We took cover behind a rock in case there was a baby around, but all she did was look at us. We made our way through the forest opposite her direction. While there is a class two way up, we decided to tackle a more direct route that was in the fourth class, which added some fun adventurous scrambling to the day. Krumholtz looking like a large Bonzai with Glacier Gorge in the background. This is a great shorter but still somewhat challenging ascent, which offers very rewarding views of the surrounding locale. Don't slip! We headed north to find the second class ramps that head up the mountain. Easier going, but just as exposed. I didn't pay attention to the time when we got back to the car, but it was early afternoon. A refreshing beverage was had before we started to make our way down. Every week we can see an increase in the amount of cars in the parking lots, more people on the trails, and many more people in Estes Park. It was great to get to Sky Pond after several attempts. It does offer a very pretty place to have a bite to eat and relax for awhile. There is still snow covering the trail once you pass The Loch, but the way is pretty well beat in and relatively posthole free. Glacier Knobs are fun and really do not add that much more difficultly and do offer a great view and sense of reward (particularly the East one). Consider checking those out next time you are up this way! Sky Pond: 4.4 miles one way, 1720 foot gain. Moderate +. Glass Lake: 4.2 miles one way, 1640 foot gain. Moderate +. Timberline Falls: 3.9 miles one way, 1300 foot gain. Moderate. The Loch: 2.9 miles one way, 1000 foot gain. Moderate. West Glacier Knob: 2.6 miles one way, 1100 foot gain. Moderate. East Glacier Knob: 2.3 miles one way, 1045 foot gain. Moderate. Second class at least.